This is so ridiculously easy to make it shouldn’t even be called a recipe:) It does, however, taste amazing! Unfortunately you do need a dehydrator to make these though. I guess you could try making these in the oven at a very low temperature, but I haven’t done that before so I can not give advice in that regard…. Slice the tomatoes into thin slices. The first time you make these, slice them in different “thicknesses” to see how you prefer them. Personally I usually slice them roughly 1/2 cm thick – no need to be accurate though. Sprinkle generously with the herb of your choice and black pepper, then sprinkle VERY CAUTIOUSLY with salt. The tomatoes are going to dehydrate and shrink considerably so the salt is going to end up being very concentrated. Rather under salt…. Dehydrate at a high setting for 2 hours and then reduce to a low setting for 12-24 hours or as long as needed for them to crisp up nicely. 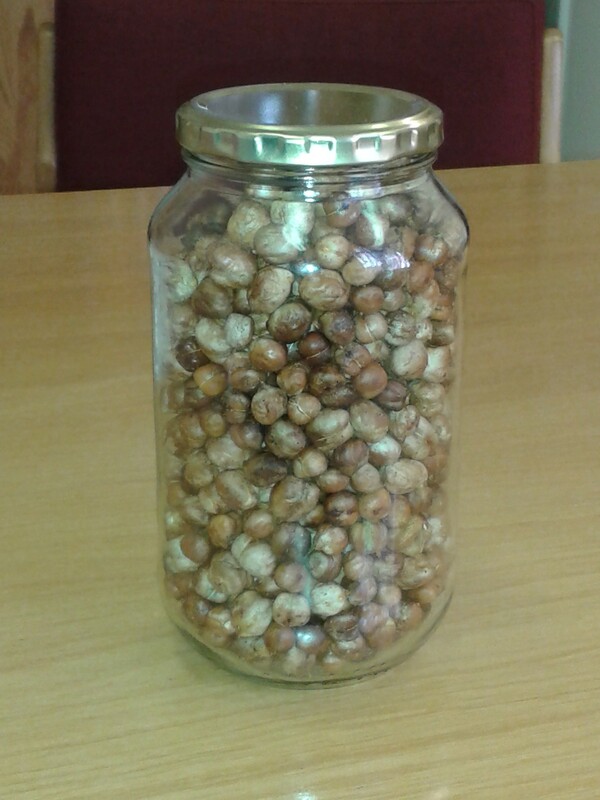 They have an amazing crunch and make a fabulous chip substitute:) You can store them for ages in an airtight container. At this point I would like to point out that I have never been a cauliflower fan. I don’t hate it, but I really don’t like the smell of it once it is cooked and I have never been crazy about the taste either. But because this is stir fried instead of cooked, it doesn’t get that awful smell of cooked/steamed cauliflower and the taste completely vanishes. Obviously the texture of the grains is not exactly the same as rice. Rice has a glutinous, squishy texture while this has more of a crunchy, fresh texture, but the taste is identical, the calories are ridiculously little and the health benefits are amazing. 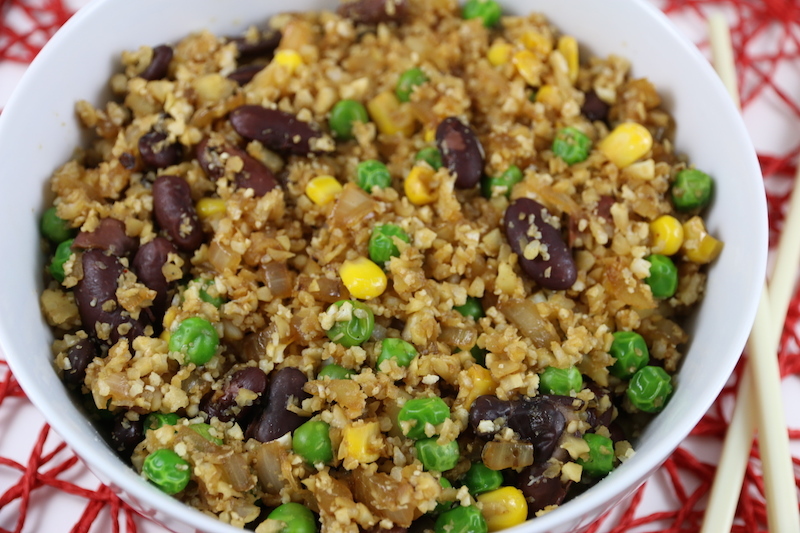 This has become one of my favourite movie dinners because it takes 5 minutes to throw together and I end up with a HUGE bowl of delicious fried rice which is full of amazing veggie vitamins, but doesn’t taste healthy at all. Everyone likes fried rice a little different. I like mine with loads of onion, garlic and soy sauce, my mom likes hers spicy….Some like it with a honey/ginger/garlic sauce. Use this recipe as a template and adapt it by adding your preferred extras to make it perfect for you. add ins: I usually use frozen sweet corn, peas and carrots. In this picture I used frozen sweet corn, peas and spicy salted red kidney beans. Inspect the cauliflower and cut off any yucky brown bits. Now chop off the florets – you can set the core and stems aside for use in soups. Place the florets into a food processor and process until you have rice size bits. Do not over process to the point of pulp. This is your rice! Set it aside. If you don’t have a food processor, you can grate the rice on your grater – works just as well. Chop one large onion or 2 small onions for every head of cauliflower that you use. Crush the garlic cloves. I like lots of garlic and use about 4-5 cloves per cauliflower head. Get your add ins ready. Pour 1 teaspoon olive oil into a wok or a large non-stick frying pan and heat up on high. When oil is hot, add the onion and stir fry until nicely browned. Add in garlic and stir fry for another minute. Add cauliflower rice and mix through the onion/garlic mix so that the rice absorbs these delicious flavours. Add in frozen veggies/fresh veggies of your choice and stir fry. Pour soy sauce/tamari over and mix through (I start with 2 tablespoons per cauliflower head and work my way up from there). Taste and add more soy sauce until it is salty enough for you. Don’t cook your cauliflower into a pulp – you want to stir fry it so that it is still crunchy. When soy sauce is nicely mixed through and the frozen veggies (if used) are heated through, dish fried rice into a large bowl and tuck in! This recipe is ridiculously simple. You look at it and can’t quite fathom how so few ingredients can taste so good. Please please try it – you will get hooked instantly! 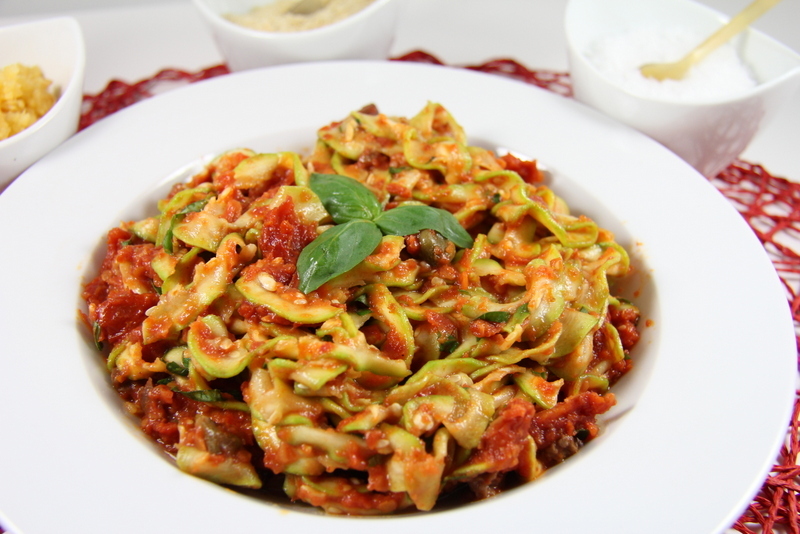 The key to this recipe is using an amazing sundried tomato that has been soaked in olive oil and spices. The tomato pieces must taste amazing on their own. 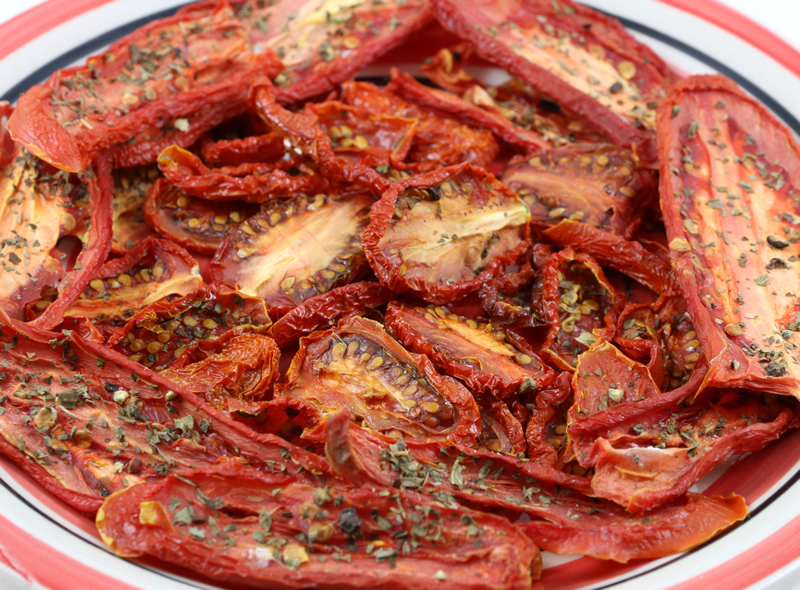 In South Africa, Ina Paarman has incredible sundried tomato quarters that have been soaked in a vinagrette. 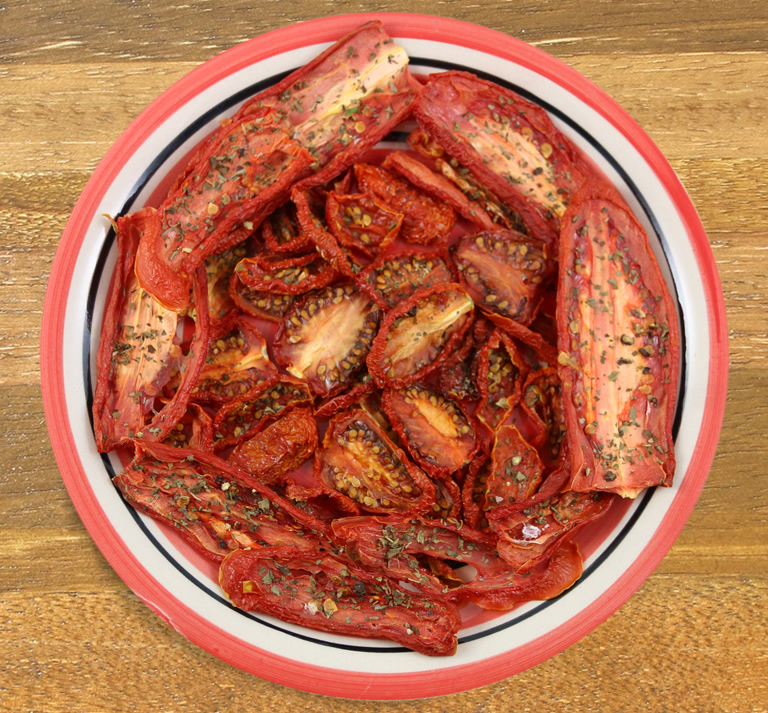 The tomato pieces are so soft and flavourful that you can’t stop eating them straight from the packet! You really taste the tomatoes here so be sure to use spectacular ones. 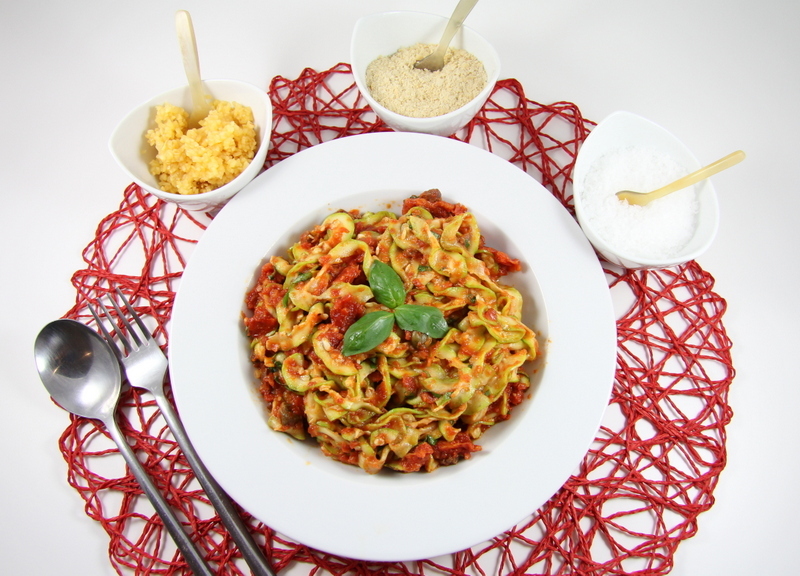 Using a spiraliser, make zucchini pasta. I made flat noodles for this dish. 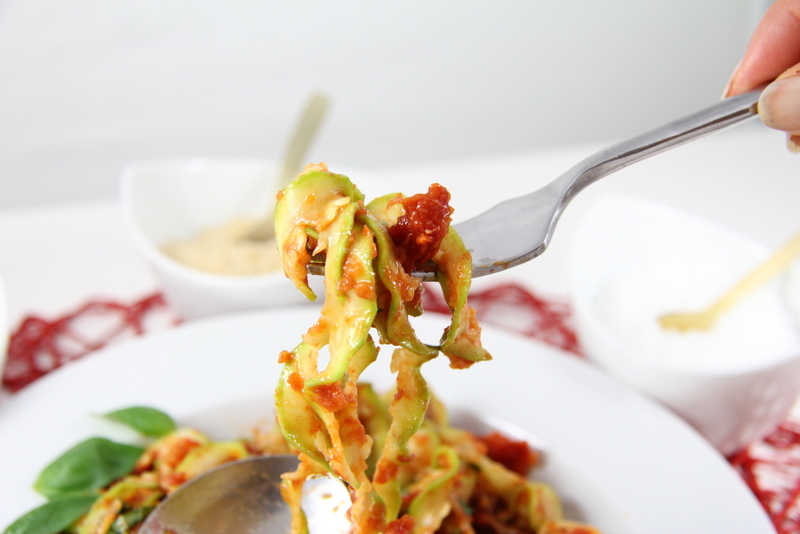 Alternatively, use a veggie peeler to peel strips of zucchini (like tagliatelle). I like to peel the zucchini before making it into noodles as I don’t like the taste of the peel when raw. Set aside. Place tomatoes in to a blender with 2 tablespoons each of water and extra virgin olive oil. try to blend. If more liquid is needed, add in an extra tablespoon of both water and olive oil again. You don’t want to add more liquid than needed though as you don’t want to dilute the amazing flavour of the tomatoes. I ended up adding about 1/4 cup of water and olive oil each. The tomatoes do not need to be blended into a completely smooth paste – just smoothish – a bit of lumps creates texture which is nice. Tear up some basil leaves and mix them into the sauce. Yet another amazing recipe from Emily! Chickpeas – You can buy the cans of chickpeas and just drain, rinse and pat dry before roasting or you can buy the packets of dry chickpeas and soak them in water overnight. Drain and dry them before use. Seasoning of your choice. I love Steers salt or even plain salt, but play around with a variety of seasonings such as barbeque salt, chilli salts etc until you find your favourite option. Spray a baking tray thoroughly with non-stick spray. Throw in chickpeas and spread them out. Spray chickpeas thoroughly with non-stick spray, sprinkle your chosen salt over, shake the tray around a bit so that the chickpeas roll around. Respray with spray and season again. Bake in preheated oven at 200°C. Take the tray out at 10 minute intervals and stir them around a bit before putting back in the oven. When they are firm to the touch, let one cool slightly and pop in your mouth. I like it when it is firm on the outside and has just a tiny bit of softness in the middle. Some prefer it rock hard to the core. Find your happy texture by baking shorter or longer. Remove from oven and allow to cool completely before storing.